An offshoot of Sallie Mae, SmartyPig offers only one kind of savings account. However, its savings accounts offer some of the highest interest rates in the industry, earning more than most competitors, even big banks. SmartyPig also has a unique feature that rewards you for recommending the bank to friends. You can earn $10 for every new customer you refer, further boosting your savings. SmartyPig really shines when it comes to its format that allows customers to easily set savings goals and keep track of progress. This means you get to personalize your account whether you’re saving toward a new TV or for college tuition. Plus, you can easily access your accounts in a number of ways whether online, over the phone or by email. You might already be familiar with Sallie Mae Bank for its student loans connection, although the company offers much more than that. In fact you can open a number of savings accounts with Sallie Mae. SmartyPig is one of those savings offerings. In fact, SmartyPig is more of its own savings vehicle in partnership with Sallie Mae. Why the name SmartyPig? SmartyPig brands itself as a free, online and FDIC-insured “piggy bank,” helping you save for anything and everything you might need to save for. From saving up for a new bike or saving for college, SmartyPig can help you get there. SmartyPig offers simple savings accounts with high interest rates that depend on your account balance. SmartyPig works by personalizing your savings accounts according to your own savings goals. You set up your goals yourself, whether you’re saving for new sneakers or for your retirement. That way, both you and SmartyPig have a concrete goal to look toward. SmartyPig believes that this method improves saving and makes the process more rewarding and motivating. Plus, you can easily track your progress toward your goals with SmartyPig. SmartyPig takes rewards even further by offering a friend referral system. For each friend you refer to SmartyPig, you receive a $10 reward. You also have the option to purchase an Amazon.com gift card directly with your SmartyPig savings. Access to Your Savings Account Online and by phone. Security FDIC insureance up to the legal limits. It can be hard to save money, especially when you’re constantly tempted to spend it. Savings accounts can help you get over that savings hurdle. With a savings account, you can put money away and out of your reach. Not only that, but your money can grow in the account thanks to interest. Plus, federal laws limit the number of withdrawals you can make from savings accounts per statement cycle. That way you won’t be able to deplete your savings account and defeat the whole purpose of having a savings account. SmartyPig is here to help you save with its savings accounts. As a customer, you can set your own savings goals for each account. So for example, you can set the goal of saving enough for a new bike within a year. As your money grows within the account, you can see how much closer you are at reaching your goal. That way, when you reach it, you can feel more rewarded at the end. SmartyPig is also able to help you reach your savings goals even faster with some of the highest rates in the industry. There is no minimum deposit or balance required. However, to start earning interest you will have to have at least $0.01. SmartyPig limits your account balance to a maximum of $250,000. Interest is compounded daily and credited monthly. After your initial deposit, you can set up recurring contributions to your savings account either monthly or biweekly. This is easily done by linking a checking or savings account to your SmartyPig account. 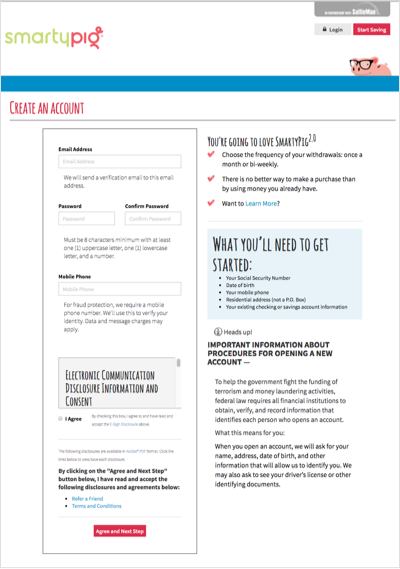 SmartyPig will verify your identity when you try to add an account or make any changes to it. At the moment, you can connect only one banking account to your SmartyPig account. You can still make deposits into your account whenever you like. Deposits into your account must be made in U.S. dollars, and not in the form of checks, cash, money orders or wire transfers. When it comes to transfers out of your account, you are limited to six per statement cycle as determined by federal law. If you go over that limit, you can face some heavy penalties. If you’re unsure about how many outgoing transactions you’ve made, your accounts are easily accessed online. There, you can also change your settings and information. These kind of changes will also need identity verification before being approved. Luckily, SmartyPig is only here to help you save. There are no monthly maintenance fees for holding the account. Even if you don’t reach your set savings goal, there are no penalties or requirements. You can simply change the goal to a later date, transfer funds to a different goal or into your SmartyPig Primary Account for future use. Your account and goals are easily accessible. Plus, you also have the option to add a beneficiary to your account. Where Can I Find SmartyPig? 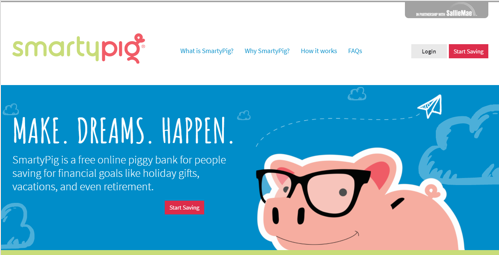 You can find SmartyPig online at its website (the homepage is shown here). Since SmartyPig only has one savings account to offer, the site mostly covers what SmartyPig is and how it works. There's also an extensive FAQ section to answer any further questions you might have before you click that "Start Saving" button. You can also find SmartyPig through Sallie Mae's website. There are no physical branches of SmartyPig. If you need to contact someone at SmartyPig, you can call its Customer Support Team at 877-751-6884 on weekdays from 9 a.m. – 6 p.m. EST. You can also email support@smartypig.com. SmartyPig advises that you do not send any personal or account information like account and Social Security numbers over email. What Can You Do Online With SmartyPig? SmartyPig is entirely online. If you don’t have an account yet, you can easily learn about SmartyPig and its offerings on its website. If you do have an account, you can easily log in through the main website. Once you’re logged in, you can access all your accounts and make changes there. The website is secure as is SmartyPig’s processes to verify your identity before making certain changes. Your money is easily accessed through your online account. If you deposit money into your SmartyPig account without allocating it to a specific goal, that money goes into your SmartyPig Primary Account. When you log into your account, you can move that money around to your specific goals as you see fit. Once you reach a goal, you can easily withdraw that money. While logged into your account, you have to initiate a transfer from your savings goal to your external checking (or other savings) account. If you don’t reach an account savings goal by the target date you set, you can just as easily transfer those funds to a different goal or into your Primary Account. You also have the option of just changing the target date of your original goal. How Can I Save More Money With a SmartyPig Account? SmartyPig offers some of the highest rates in the industry. Opening an account with SmartyPig can earn you much more on an original deposit than many big banks can. Plus, SmartyPig can do that in a shorter period of time, while providing you with advice and financial tools. Setting up recurring contributions into your SmartyPig accounts will also help you save more. You can choose between a monthly or biweekly recurring deposit from an outside bank account. That way, you can set it and forget it while your SmartyPig account continues to grow and grow. SmartyPig can also save you money by stopping those automatic contributions to an account once you’ve reach the set goal of that account. It can also cut down on a contribution if only part of the amount is needed to reach your goal. That way your external account won’t be unnecessarily drawn from. Lastly, SmartyPig can award you referral money. For each friend you refer to SmartyPig that opens an account, you receive a $10 reward. Your referral must actually open an account with SmartyPig and fund it with at least $25 within 30 days for you to receive the reward. What’s the Process for Opening an Account With SmartyPig? Once you’re on the SmartyPig website, opening an account is simple. All you have to do is click one of the “Start Saving” buttons that you can find on each page. The registration process consists of four steps on the secure website, the first of which is shown here. You will need to provide personal information like your Social Security number, date of birth, phone number, residential address and existing checking or savings account information. To open an account with SmartyPig, you must be at least 18 years old and have an existing checking or savings account. You must also be a U.S. citizen, U.S. permanent resident with a green card and Social Security number or a U.S. Resident with a Social Security number. Having an easily navigable website with all you need to know on there is a big plus for any company. SmartyPig is no exception. However, some people may be looking for a savings account with a company that has physical branches, which SmartyPig lacks. Or perhaps you’re looking for a Customer Support Team that’s accessible over online live chat and not just over the phone or email. These can certainly be drawbacks for some potential SmartyPig customers. Also SmartyPig only offers basic savings accounts. So if you’re looking to open a savings account, certificates of deposit and a money market account with the same financial institution, SmartyPig won’t be the place for you. As of right now, you can link only one External Funding Source to a SmartyPig account. This means that if you wanted to set up direct deposits from a couple different checking accounts, you wouldn’t be able to do so with SmartyPig. SmartyPig is an excellent option for those who find saving money daunting and difficult. The website is easy to navigate and doesn’t have too many dense explanations. Having an account with SmartyPig is equally as straightforward. You are able to tailor your accounts to your own specific savings goals. That way you can work toward a specific goal, like a wedding or college savings. SmartyPig makes saving an easy and more personal experience.